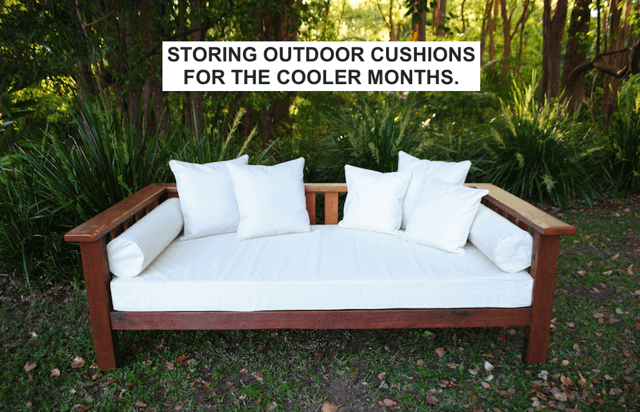 If you haven’t already done so, now is the time to store your outdoor cushions over the Winter, so you have clean, bright cushions for when the weather warms up again. Properly cleaning and storing your outdoor cushions will help them stay looking like new for longer. Your cushions collect a lot of dust and debris while outside, so they need to be cleaned. Mold and mildew needs to be removed, if any has taken to your covers, so it doesn’t spread. All your cushions and covers should be thoroughly dried before being stored away. Here are some tips to follow when looking after your outdoor cushions. 1. Vacuum dust and debris from your covers – Before washing your covers, a good vacuum will help remove dust/debris from your covers so it won’t settle into the fabric as stains. 2. Remove covers and either wash by hand or if allowed machine wash – check with the manufacturers with regards to whether the fabrics are machine washable. Our polyester fabrics are NOT machine washable, however our 100% Solution Dyed Olefin and Acrylic are. 3. Use a non-abrasive detergent if doing it either by hand or machine and use a gentle cycle if in the machine. 4. Ensure you rinse your covers thoroughly to ensure all of the soap mixture is removed from the covers, and that all the accumulated dirt and debris is washed away. 5. Dry your cushions thoroughly in an open area out of direct sunlight. The cushions must be thoroughly dried before storage so mold doesn’t form on them. You may want to put your cushions in direct sunlight, however we don’t recommend it as this may lead to sun damage and faded colours. Your cushions can be stored in a number of ways. Depending on your budget, how much space you have or what you like, we have tried to find something for everyone. 1. Waterproof/Weatherproof Plastic Storage bins – these come in many different sizes and shapes and can even match your outdoor furniture, so will blend in with the décor. 2. Waterproof Storage bags – these are great if you don’t have many cushions or very large cushions. 3. Move cushions to an enclosed dry area – once you have selected how you are going to cover your cushions, place your cushions in your garage, attic or somewhere similar, but check for water or damp beforehand or you will be faced with mold-stained cushions come Spring time. 4. Ideally if you have the space the best place to store your cushions over the Winter months is indoors. If you live in an area of high humidity then ideally you should look at keeping your cushions in a climate-controlled environment. Using packaged desiccant will also help remove moisture from air in plastic bags. Once the weather has warmed up and you are ready to entertain and enjoy outside living, you will have cushions looking clean and fresh and ready to go. A little effort now will pay off later, properly preparing your outdoor seat cushions for winter storage will extend their life and make yours so much easier come Spring. This entry was posted in Custom Cushion Covers and tagged custom cushions, outdoor cushions, outdoor living. Shop our range of resort style outdoor bean bags and outdoor cushions, or contact us for a quote to have your outdoor cushion covers replaced.